Proper equipment selection and tuning is fundamental. 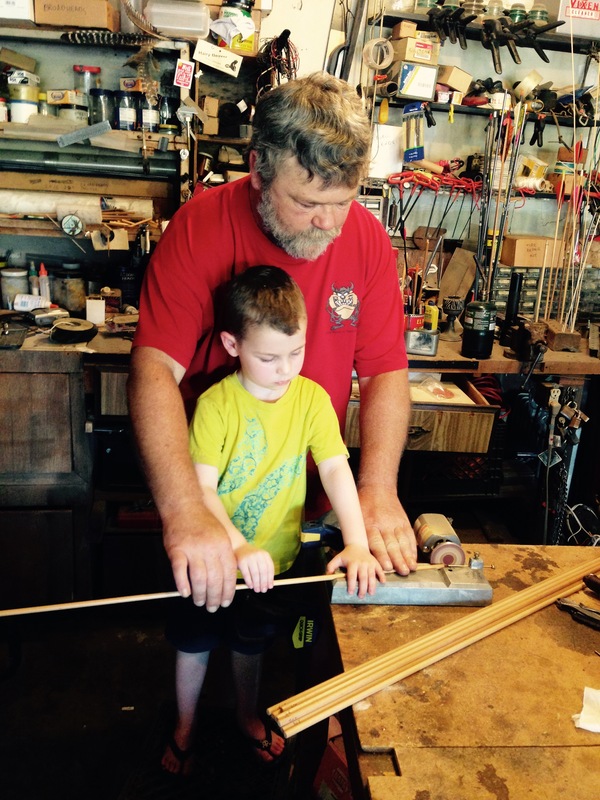 In this post Paul Fender shares his wisdom and beliefs concerning equipment choices and experimentation (shown here teaching his grandson Ezra the art of arrow building) – I am grateful for his contributions to our growing body of knowledge! Here are just a few thoughts about equipment for those who are serious about Archery and their shooting. “Good enough” isn’t. That’s just something to keep in mind when making equipment choices, or dealing with bow tuning, or whatever. You always, always, ALWAYS, want to have equipment that you know for an unquestionable fact will shoot better than you are able to. Reduce the variables and remove all doubts so that when you encounter difficulties, you know where to look in order to address them. You will know that it is something within yourself that needs attention. Obviously that all relates to having good equipment that always enables you to shoot your best, that enables you to always push your limits. But there is even more to making your own gear than just that. When you make something, you “own” that thing in a way that is deeper and more meaningful than if you had simply bought it. Looking to up your game? Then OWN it! It is often said, “Fear the man with one bow.” The idea there is of course that he is the one who knows his equipment to the finest degree possible. He will therefore be nearly unbeatable. I guess that perhaps there is some degree of truth to this. Personally I’m not a real believer in that idea though. I myself am always trying a different bow, or different arrows, or some other different piece of equipment or equipment set up. Why? Well, sure part of it is because of how I am. I am always curious about, “What if I tried this or that?” But it also carries a benefit. By always investigating the new and different, a shooter learns a LOT! Things like bow style, grip shape, type of tab or glove to use, which aspect of form needs beefing up, etc. The list just goes on and on. By trying new stuff we get to learn and practice something that is very important to stepping up our competitive game. We get to learn to, “Improvise, Adapt, and Overcome.” We learn that when faced with a problem, we CAN figure out what we need to do to solve it. I have noticed something over the years. Often people try something new, and their shooting seems to improve. For like a minute. But then they return to their own regular level. Or maybe they try that new thing, and just either accept it or reject it for no real reason. This is all what I call, “New Toy Syndrome.” When trying something new I recommend that you give it an honest chance. Try it for a week or so. Not only that though. Apply a little objectivity. Take videos of yourself shooting both with and without the change. Shoot at actual target faces and keep track of your scores with and without the change. Apply a little methodology and get some objective data on whether or not a change is good, bad or indifferent. After all, we should never forget that all too often, the easiest person in the world to fool is ourselves. Involuntary flinching, clutching, twitching, or jerking. “Locking up” or “hitting a wall” as the archer tries to anchor or aim. Releasing the arrow prematurely, before coming to full anchor. I have some published research to my credit and originally intended to conduct a full blown scientific research study. Instead I decided to explore this topic more informally. However to be somewhat thorough I am including a few references and have commented on them to enhance the conversation. Because I was going to conduct a research study, I started collecting accounts of Target Panic from people experiencing it. This written description provides a rich glimpse of what it is like: Target Panic Description. There is a LOT in this description worth noting. I wanted you to hear something personal and first-hand before reading published articles that include editorial comments and suggestions. 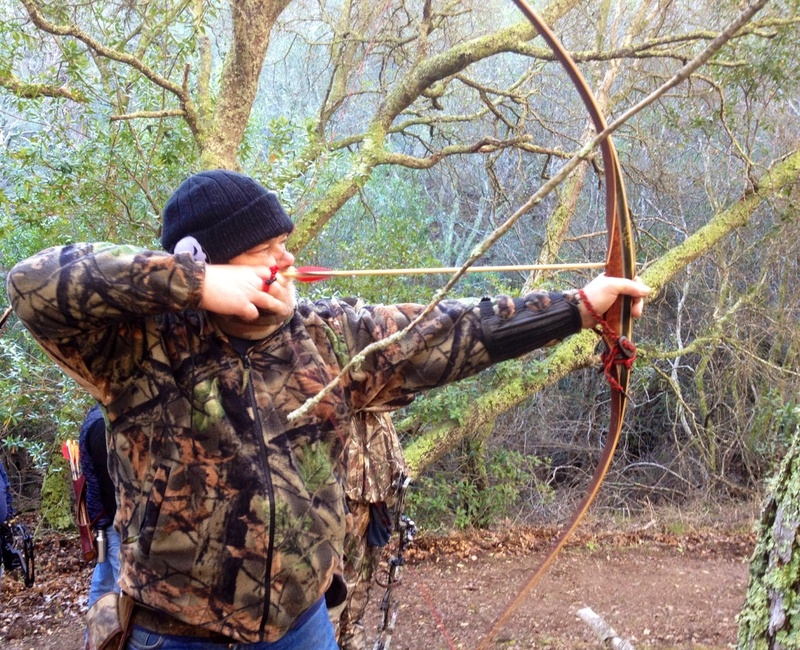 This NY Times article is a comprehensive editorial piece: The Secret Curse of Expert Archers. What I find most interesting is the author’s claim that Target Panic could be psychological or neurological in nature. On the psychological front, the author notes that the anxiety people experience in response to Target Panic makes it worse. My favorite comment in this article is an appropriately cautionary one: a “cottage industry” of coaches, books, and accessories for cure have arisen in response to the phenomenon. Here is a very entertaining article written by Ted Nugent: Conquering Target Panic. Ted talks to us like he’s our friend and he wants us to have hope. What strikes me the most about this article is that Ted suspects Target Panic as a major cause of people giving up on archery – so sad! The other major point to take away from Ted’s article is that like the coaches cited in the other articles, he normalizes Target Panic as a very common thing. This is the best article of the bunch: Beating the Curse. It combines the down to earth writing style of the Nugent article with some very insightful technical information. For me though it is a little too emphatic in its emphasis on what the author calls “the real problem” (afraid to hit the middle and anticipation of the shot). The author spells out a very useful plan for battling Target Panic, albeit based on solving what he identifies as “the real problem.” If you are a Traditional Archer you’ll have to ignore the verbiage about “the trigger” and the (sight) “pin” in order to make use of his very sound advice. My favorite part of this article is Step 3 – Enforce The New Habit! An initial period of good performance. A sudden and unexpected onset of Target Panic. A lack of control; an inability to stop doing something undesired or do something desired. Negative thoughts in response to the Target Panic. I’ve struggled with Target Panic personally. Based on my experience I believe it can also be a stimulus-response problem. I became very good at shooting Compound Freestyle with a scope – I’ll never forget the day I shot a perfect 20 on the 70 yard walk up target – I won the Regional Championship that year! Shortly after that, I developed a flinching problem whenever I tried to center the spot in my scope. I found some effective strategies to manage the problem, but I had to constantly work at it and archery became a chore, lost a lot of its fun. 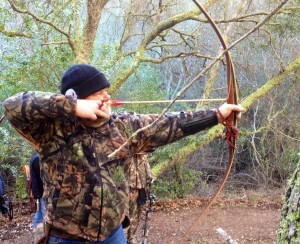 Then I discovered that I did not have the problem if I shot a Traditional bow “instinctively” without a sight (see my Aiming Without a Sight post). Shooting this style brought the fun and passion back to archery for me, and allowed me to be competitive again, so I sold my compound bows and gear and made the switch. BUT, whenever I try to develop a more precise aiming method like “gapping” (again see the Aiming Without a Sight post) it comes back. Hence the stimulus-response theory. Like the person in the Target Panic Description, I also found that lowering my draw weight helped. I also have a hunch that some personality types are more prone to this than others, but I’ll save that for another discussion. Face the Problem; it’s a puzzle to be solved, don’t allow negative thoughts get the best of you. Don’t hide it or pretend it’s not there or that it will magically go away. Call it something different – like mentioned in the NY Times article you don’t have to use the negative, loaded term Target Panic – you can be more descriptive: “I’m doing such and such to help me come to full anchor; I’m doing so and so to keep from releasing too soon,” etc. Play with Options; very rarely does one size fit all – experiment with solutions until you find one or more that work for you. There are a wide range of suggestions within these articles! Be in Process; things like this are rarely “cured” right away, sometimes not at all – adopt a process mindset and come up a with strategy you can “plug and play” whenever the problem rears it’s head – chances are it will re-emerge from time to time. If you decide you want to take your Traditional Archery to the next level (beyond recreational enjoyment) you will most likely want to focus more on your equipment. The attached Traditional Archery Tuning document provides a comprehensive overview of the relationship between the bow, the arrows, and the string. These are very important fundamentals, THEY MATTER in a very technical way. As the author explains, our goal is to create the most forgiving setup we can accomplish without sacrificing efficiency. If your Traditional Archery setup will include the use of a plunger, you need to familiarize your self with Tuning For Tens. If you buy a set of custom built arrows from Ohlone Archery I will bare shaft test your setup to ensure you get the best possible arrows for your bow, whether you are recreational or more serious. You can also schedule a private session to work through a more comprehensive tuning of your equipment.